First year care of grapevines is critical to the long-term health and survival of grapes. First year grapevine care should be focused on training vines to grow along trellises. Once grape vines are established, special attention should be given to the pruning of grape vines so that the vines continue to produce an abundant crop of grapes. In addition, older grapevines should be nourished with fertilizer and guarded against infestation. With regular maintenance, a grape vine may live well over 50 years. Prune newly-planted grapevines back to the single, strongest vine. This vine should have between two and five shoots on it. Insert an upright piece of cane into the ground and tie the each shoot loosely to the cane so that it will grow upright up to a trellis. Never bind the vine, because it will expand quickly as it grows. Mulch around plants and remove any weeds that may compete with young grapevines. Time your grapevine pruning annually during late winter or early spring when the vine is dormant. Select the strongest, heartiest vine and prune away all others at the end of the first year. At the end of the second year, prune away all but the two strongest side shoots. Allow these side shoots to grow along the top of the trellis wire leading away from the main vine. Allow the side shoots to grow during the third and fourth year, but remove any new shoots that grow on the vine trunk. After the third year of a vine’s life, select two to four fruiting canes per vine. Cut back each of these so that there are only 15 new buds per cane. For wine grapes, leave approximately 30 new buds per plant. For table grapes, leave 80 buds per plant. Allow a second cane spur with two buds to grow near the fruiting cane. This will grow to become the fruiting cane for the next year. Water grapes sparingly. Grapes grow best in areas where rainfall provides enough water to nourish the vines. If you must water, do so at the soil level. Wet fruit will rot. Fertilize sparingly with a 10-20-20 fertilizer in the spring months. Over fertilizing will delay the maturity of the grapes. Harvest grapes when they reach maturity. 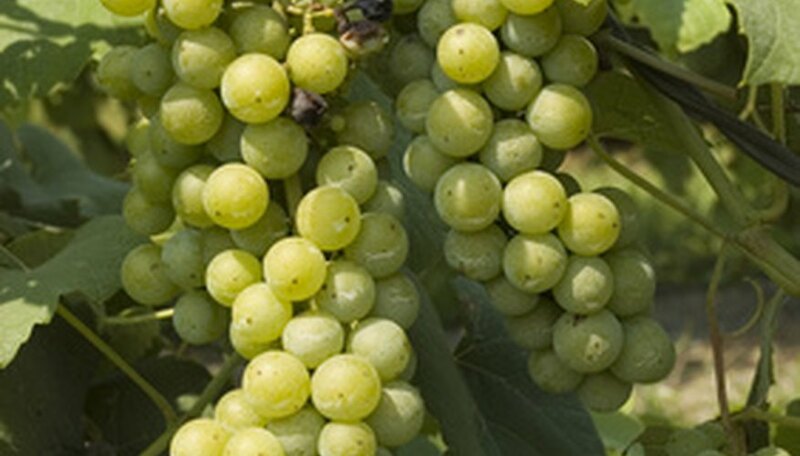 Mature grapes will have a sweet flavor, and their seeds will become brown.